RVUNL Recruitment 2018 - Below are various recruitment notifications published by RVUNL - Rajasthan Rajya Vidyut Utpadan Nigam Ltd. / energy.rajasthan.gov.in. As of now, we don't have any active recruitment notification by RVUNL featured here. We may update as soon as the organization announces a new job notification. If you are looking for any information related to previously organized recruitment drives by RVUNL, you can browse through previous job notifications mentioned below and get the new updates or information you are looking for. RVUNL Recruitment 2018 - Apply Online for 2089 Helper Posts in Department Of Personnel, RVUNL, Rajasthan. Online Applications are invited by RVUNL - Rajasthan Rajya Vidyut Utpadan Nigam Ltd. from 01 Sep 2018 to 15 Sep 2018 for 2089 Vacancies. RVUNL Recruitment 2018 - Apply Online for 2433 Technical Helper Posts in JVVNL, AVVNL, and Jd.VVNL, Rajasthan. Online Applications are invited by RVUNL - Rajasthan Rajya Vidyut Utpadan Nigam Ltd. from 02 Jul 2018 to 23 Jul 2018 for 2433 vacancies. RVUNL Recruitment 2018 - Apply Online for 46 Assistant Engineer Posts in RVUN, RVPN, JVVN, AVVN, JdVVN, Rajasthan. Online Applications are invited by RVUNL - Rajasthan Rajya Vidyut Utpadan Nigam Ltd. from 14 Jun 2018 to 02 Jul 2018 for 46 vacancies. RVUNL Recruitment 2018 - Apply Online for 1151 Junior Engineer, Junior Chemist & Informatics Assistant Posts in RVUN, RVPN, JVVN, AVVN, JdVVN, Rajasthan. Online Applications are invited by RVUNL - Rajasthan Rajya Vidyut Utpadan Nigam Ltd. from 14 Jun 2018 to 02 Jul 2018 for 1151 vacancies. RVUNL Recruitment 2018 - Apply Online for 3151 Junior Assistant/ Commercial Assistant II, Jr. Accountant, Stenographer, Assistant Personnel Officer & Junior Legal Officer Posts in RVUNL, RVPNL, JVVNL, AVVNL, JDVVNL, Rajasthan. Online Applications are invited by RVUNL - Rajasthan Rajya Vidyut Utpadan Nigam Ltd. from 22 May 2018 to 11 Jun 2018 for 3151 vacancies. RVUNL Recruitment 2018 - Apply Online for 69 Personnel Officer & Accounts Officer Posts in RVUNL, RVPNL, JVVNL, AVVNL, JDVVNL, Rajasthan. Online Applications are invited by RVUNL - Rajasthan Rajya Vidyut Utpadan Nigam Ltd. from 22 May 2018 to 11 Jun 2018 for 69 vacancies. JVVNL Recruitment 2017 - Latest job notification for Chartered Electrical Safety Engineer (CESE) Posts in Rajasthan. 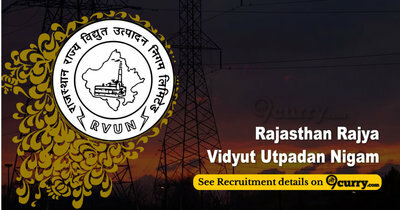 Applications are invited by Jaipur Vidyut Vitran Nigam Ltd. (JVVNL), Rajasthan Govt. before 31 Jul 2017. RVUNL - Rajasthan Rajya Vidyut Utpadan Nigam Ltd.
Jaipur Vidyut Vitran Nigam Ltd. (JVVNL), Rajasthan Govt.